Could today’s rail bikes save yesterday’s railroad? In a companion story we have outlined the difficulties of saving what is left of the historic Lake Superior & Mississippi Railroad and adapting it for reuse as a vital heritage railroad (click here for that story). Despite those hurdles, there might be a way to retain and reuse the historic rails of the Lakes Superior & Mississippi Railroad, but it would not include the operation of a diesel or steam train. The historic lightweight rails may not be able to handle a full-sized train, but they could certainly handle rail bikes—four-wheeled, pedal-driven vehicles that actually ride on the rails. 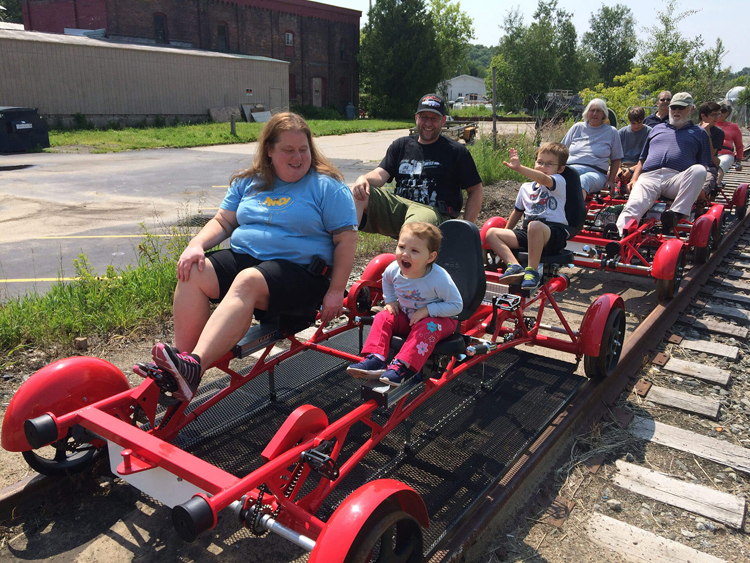 They are fast becoming popular at heritage railroads across the U.S.
Rail-bike train excursions could also create a start-up business or help an existing operation such as The Duluth Experience expand its offerings. Guides could share not only the railroad’s history, but also the history of shipbuilding in Riverside, the company town of Morgan Park, the Minnesota Steel Plant, the St. Louis River, and many other topics related to our history. But even rail bikes would not resolve the environmental and financial issues surrounding the causeway over Mud Lake, and the railroad bed will still need renovation and maintenance. And if it turns out the rail bikes aren’t popular enough to sustain a successful operation, once again Duluth would be faced with the question of what to do with the railroad. I like the rail bikes. I’ve not seen them before. However, I am also a great fan of both linear parks and the “Rails to Trails” projects. Both of those uses tend to be largely (in some case exclusively) maintained by users. No user fees, just conscientious, good citizens.